Save shipping costs on SCS’ (formerly 3M) SP3010 Nylon Spudger Soldering Tool. 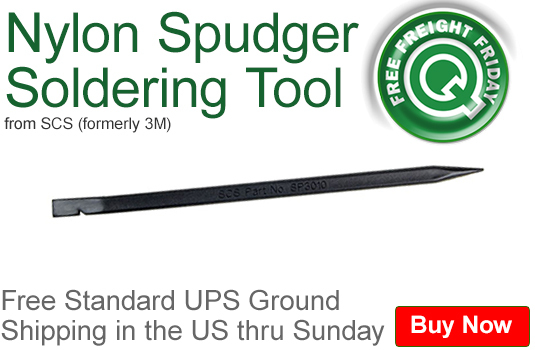 Get Free standard UPS Ground shipping in the US when you add a spudger to your shopping cart. Our Free Freight Friday (FFF) promo is valid from today, February 3, 2017 through Sunday, February 5, 2017. This awesome multi-purpose tool is temperature resistant, features a flat “screwdriver” surface, and has a notch for hooking and pulling wires or components. It’s ideal for opening plastic cases such as MP3 players, cell phones, laptops and working with wire leads on circuit boards. Follow our regular FFF and Featured Product Friday (FPF) selections on our Q Source Resource Blog, via our email newsletter, or on our social media accounts. Please help us spread the word about these great money-saving opportunities by sharing these offers with your friends and colleagues. Click here to purchase these labels. For further questions, call us (800-966-6020), or send us an email. Please note: This promo is valid only at QSource.com and expires on February 5, 2017. Click here to subscribe to our Q Source Resource email newsletter for information about sales and coupon codes, industry news, and new product offerings. Should Terry Gou for It? Employee Engagement -- Is it Increasing or Decreasing? Can it Be Sustained? © 2015 Q Source, Inc. • 1-800-966-6020 • 1-631-563-0600. Powered by Blogger.